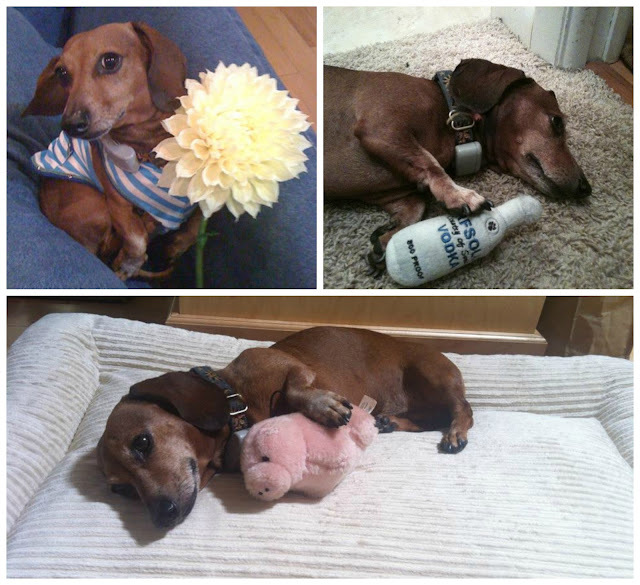 Here is a story about a little Dachshund named Deezyl and his journey with Purina Pro Plan Bright Mind. Hi. My name is Deezyl and I am the human's blog you are reading first pet. I am here to tell you my story. I was born on 12/13/2002 and Mommy (now Sissy) bought me with her first bonus check at work. She was promoted soon after and started traveling for work so my Grandma (now Mommy) and Grandpa would frequently pet-sit me. In October of 2003, my Grandpa passed away suddenly and Grandma was very sad. So Mommy made the hard decision of letting Grandma adopt me since I made her happy. Sissy still visits me all the time and she is one of my favorite humans. Cat's, especially my cousin Boo. Sissy took me shopping at PetsMart last time she visited and bought me a giant bag of Purina ProPlan Bright Mind dog food. I read on the bag that this food helps promote alertness and mental sharpness in dogs 7+ through nutrition and has introduced BRIGHT MIND Adult 7+ formulas. I will be eating Purina Pro Plan Bright Mind for the next 30 days. The enhanced botanical oils in the food are shown to have visible results within 30 days with the alertness and mental sharpness, promoted memory and trainability that I read about on the bag. I gotta go - the UPS man is here and I need to go chase him away. Talk to you in a few weeks to talk about my experience with Purina Pro Plan Bright Mind!